1) Making more space on the boot disk. There is 25% but maybe making this a bigger space will help. 2) Removing repetitive processes such as Intego task manager which Activity Monitor shows to be running all the time and using up CPU. Consider removing virus scanner completely and reloading it. 3) Upgrading the hardware. 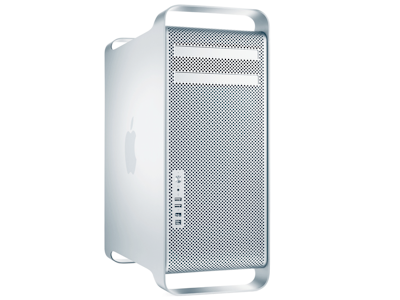 A little research finds MacUpgrade.com, whose site is pretty clever and who¹ suggest I upgrade memory by 8Gb and add a newer solid state drive [SSD]. 1) Ran CleanMyMac to free up space, threw away a load of old films, moved to 40% free on the boot drive. Small improvement. 2) Re-installed Intego. Matters improved by a similar increment. Better, but still slow. 3) Bought the upgrade. That’s the rest of this tale. Within the week from ordering, Friday from Monday, a small package arrives by Royal Mail. This is preferred over other options because the man delivers at a time I know we’ll be in. Package box is 350x100x200 (mm, of course). Inside are four things; two are wrapped in extreme bubble wrap and prove to be DIMM chips². Two, each a 4Gb 667MHz DDR2 FB-DIMM, whatever that is; big, for short. These are hugely bigger than the chips I remember fiddling with on the Apple II in the eighties. The other two are small boxes; the bigger one is very light but both are around 100x120x10. Later. Dragging the Mac Pro off the floor and onto the desk, I take the side panel off and discover how grossly filthy it is inside. Yes, I remembered to be static free by touching the ports every time I reach for the machine and every time I move my feet (sit down, fool). Fetched clean paint brush to clean insides with; made a mess on the floor to clean up later. The two little boxes I unpack prove to have an IcyDrive [pic, left, with ‘SSD' inside; pic left showing older drive], which is an empty box and I feel cheated, so I read the package order slip which says there are things left to deliver. Confused, I open the other box and discover just how small an SSD drive is, thinner than my iPhone and half a terabyte. 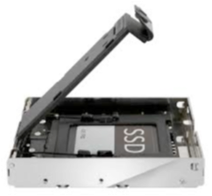 It seems that the SSD goes in the Icy Drive and then the combination goes in a drive slot. Back to OWC for another video and discover just how very organised the Pro is for upgrading; this is EASY. Four trays labelled 1 to 4 (duh); I know there are two filled already as specified when I bought it, so pull out tray three, which proves to be almost nothing – it is a little rack for carrying the new drive. Slide it in, push it home; done. Oh, this is easy. It takes much longer to put the machine back on the floor, reconnect all the cables and power up. Not surprisingly, it takes quite some time to boot up, as presumably the computer is recognising changed circumstances – memory up by three times, disk space up by 50%. When it boots up, I feel immense satisfaction at job done. Wrong: Checking the About this Mac, I have no change: 4Gb memory and no new drive. Umm. So perhaps the pairing thing should be done differently, both on one tray? Apple has a site explaining this, in clear communication; I should have looked earlier. I repeat the previous work, with less cleaning, get it all back and connected up (another hour elapsed) and behold, I have increased memory. There’s a CD with the drive, labelled ‘Magician’. Perhaps that means I need to wave a stick around in the air? It, the CD, does not work in my CD/DVD drive and it takes me a while to establish that that is not a drive fault but that this disk is for Windows customers only³. So it shouldn’t have been sent to me, should it? Back to the internet – damn good thing to have a spare machine for this sort of purpose and I don’t see how anyone does without that facility – you don’t know what you don’t know. Discover eventually a site [MacRumors thread 1611990] where people are describing exactly my problem; solution apparently to repeat the insertion of the drive until it does work. 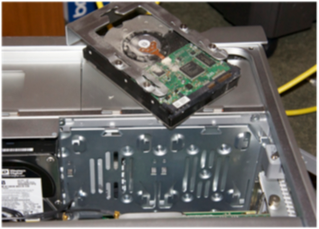 Exasperated, I pull the cover off the pro that is on the floor (and on), pull out the drive tray, pull out the SSD from its sub-box, shove it back, and see if I have a drive. Doing this with increasing vigour (meaning being more rough with it), the third try does as GrayHex said and works as if there never was a problem. Of course, by now I’ve shot off several mails to MacUpgrades asking questions (this was a Friday) but, by the time I have the drive working, it is after 17:30. So I write to say I have a success of sorts and move to the next level of problem. I have a machine that—now—says it has loads of memory and a third drive. That third drive is in slot two (among the things I tried, so I left it there once it worked). The new drive, being solid-state, should work far faster than one with moving parts; therefore I surely want that new drive to be the boot disk. So, how to fix that? The revamped machine now boots a lot quicker than before, like 12 secs from Bong to Finder, not that I rebooted it very often; good. Applications come up on the first bounce, just as MacUpgrade said. The research for the drive problem told me about other people’s problems in getting the machine to recognise the new drive. I’m supposed to be able to use the disk utility program to format the drive. Not obvious; I have to ‘erase’ the drive to format it. I can do that by starting the machine with Command-r pressed, so it gives me a very restricted access, which includes running Disk Utility—so I take the opportunity to ‘repair’ both other drives—and allows me to copy stuff to the new drive. This is different copying from sliding an icon between disks, more like cloning, but I am unconvinced I can simply copy Applications and then bin the old folder on the previous boot disk. I’ll test this piecemeal over the next week with stuff I can replace easily. On the way I discover I don’t have OS 10.7.5 as a CD. Ah, but Command-r gives me access to the internet, while still not using a boot drive, so I can download another copy of Lion onto the new disk—and can declare that to be the boot drive. That download is quite quick (now) at ten minutes—remembering Eddie Izzard’s performance⁴. The count varied from an initial 127 hours which shrank rapidly to twenty minutes; at the end of the process, with just a sliver of the temperature bar to fill, it jumped to a nine digit figure of minutes – plus seventeen seconds, then to 0 seconds, which it held for three. Liar. Anyway, now I have Lion; it takes another set of lies amounting to 10 minutes to upgrade the OS to the current version. The command-r state also allows / encourages copying stuff to the new disk, so I copied all the applications and a selection of other files. On reflection, I wish I’d copied just the software, no data. It isn’t moved, it is copied, so I have the issues of (i) deleting the unused stuff and (ii) worrying that connected files such as permissions or preferences are included in the copying process. Also, I now have 1.5Tb of disk space, so the archive disk of 1Tb won’t do Time Machine properly, will it? More on this in time. Pics from Google searches, not my own, now clean. 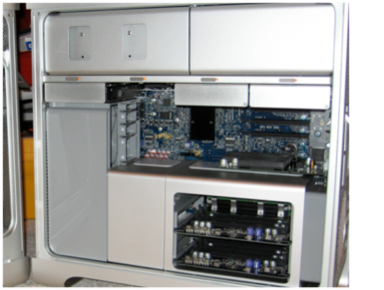 Silly question: search ‘dirty mac pro’; get a few dirty Apples, one of a Lennon/Clapton band and a lot of lipstick - why? 2 Dimm only in the sense that every computer is a very, very fast idiot. 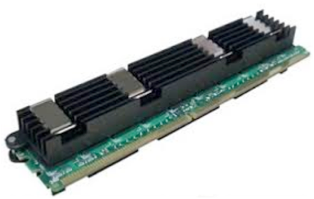 Dual in-line memory module. A string of chips on a small board made to look like one impossibly large chip. Other English words can be used to make grammatical (but not necessarily meaningful) sentences of this form, containing endless consecutive repetitions. Any word that is both a plural noun and an uninflected transitive verb will work; for example, police, dice, perch. Adding a place name like Police, Poland, can allow for a sentence identical in structure to the Buffalo example, though not necessarily with uniform pronunciation: "Police police Police police police police Police police." With head (of cattle), as there is an adjective 'head', there is no capitalisation necessary: "Head head head head head head head head". Brain ache. See also colourless green ideas sleep furiously and that that is is that that is not is not is that it it is. You should punctuate the latter. An old equivalent, for me, is to punctuate Jones where Smith had had had had had had had had the examiners approval. 4 Eddie Izzard had a routine in which he described using his computer. Among the things he pointed out in his particular style was the display indicating how long a task will take. And for the next few minutes, while telling other tales, he’d say a number of minutes, with only the first two being connected and reasonably reducing. He went on to talk about trying to print a document. Hit Command-P and wait. And wait. Check printer on; command P; wait. Check cable connected; repeat. Read website, check all of the above. Website says check connection. Pick up screen and ‘show’ it to the printer, shouting “Look, here it is! !”.